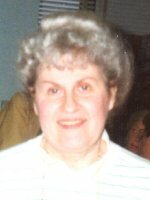 BETHLEHEM – Thelma M. “Jill” Hallenbeck, 82, of North Bethlehem, died Tuesday, February 8, 2011 at her home. Mrs. Hallenbeck was born and raised in Stillwater, moved to Albany after high school, and had lived in North Bethlehem for 51 years. She was employed by Albany Savings Bank, St. Peter’s Hospital in Maternity Admitting, and by the New York State Dept. of Taxation & Finance for over twenty years. She and her late husband enjoyed vacationing in York Beach, ME for thirty five years. Mrs Hallenbeck was predeceased by her husband Lawrence M. Hallenbeck in 2004. She is survived by her son Gary S. Hallenbeck and his wife Maria of Colonie; her grandson Scott L. Hallenbeck; and by several nieces and nephews. Funeral services will be held privately at the convenience of the family, there will be no calling hours. Interment will be in the Gerald B. H. Solomon Saratoga National Cemetery. Arrangements have been entrusted to the Hans Funeral Home, Albany. In lieu of flowers, memorial contributions may be made to the National Multiple Sclerosis Society, Upstate New York Chapter, 1650 South Avenue, Suite 100, Rochester, NY 14620.